This is the incredible moment a giant tree branch suddenly fell on to a passing car. 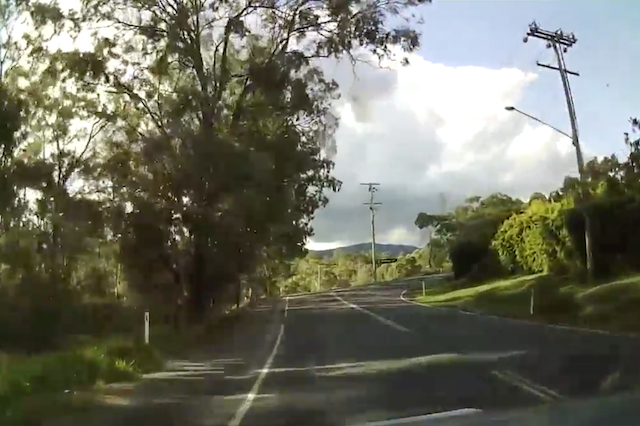 Dashcam footage recorded the terrifying incident, which took place on April 24, and shows a car travelling at a reasonable speed along a road in Brisbane, Australia. As it approaches a junction, a branch falls without any warning and crashes down on top of the car with a loud bang. The couple that were in the car were reportedly unhurt in the incident, although their car's windscreen was badly cracked by the falling branch. The footage was originally uploaded to the Dash Cam Owners Australia Facebook group, where it has been viewed more than 210,000 times. Anthony Allpress Leontiades Ring commented: "You may have to go out on a limb and buy a new car before you thought you needed one... Drop into your nearest branch to sort finance and you're away."